With Halloween right around the corner we thought we'd help our readers prepare for this fun family holiday. For kids that are big and kids that are small, find the right spooky (or not-so-spooky) boooooooks for them all! Five Little Pumpkins – Illustrated by Ben Mantle. I love this one because it’s a quick read (we all know that toddlers want “just one more”) and because my kids love it when I sing “the Monkey’s on the Bed” as they jump on my bed! They thought it was cute that the song could be made about pumpkins too! 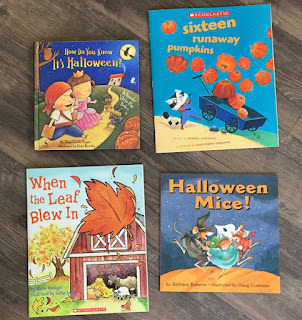 Sixteen Runaway Pumpkins – By Dianne Ochiltree and Illustrated by Anna-Sophie Lanquetin. My four-year-old, Mattias, loves this one because he is really into counting and math. While some little ones may get tripped up with the multiplication, it was mostly simple addition and a cute rhyming story! Being that I have two boys, when disaster strikes (such as pumpkins falling out of a cart) they seem to find it hilarous! Halloween Mice – By Bethany Roberts and Illustrated by Doug Cushman. We have a cat a home, so the boys are always happy to read about cats! The illustrations of the mice dressed up for Halloween in this book were super cute and this book really helps us get into the Halloween spirit at home!